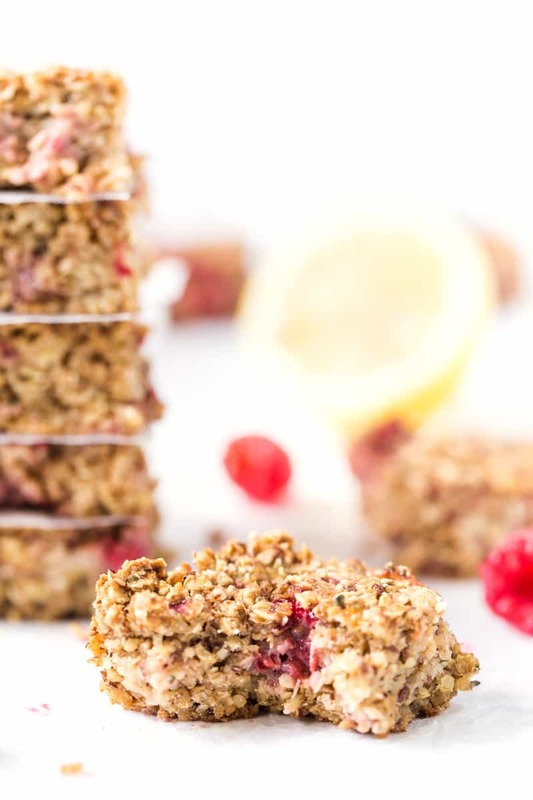 These Lemon Raspberry Quinoa Breakfast Bars are a nutritious, high protein breakfast that is perfect for on-the-go! Naturally sweetened, vegan and GF too! It seems that each summer, I tend to revisit the same recipes and give them a slightly updated twist. Two summers ago I shared my Blueberry Quinoa Breakfast Bars and they have since become one of the most pinned recipes on the site (almost 250K times!). 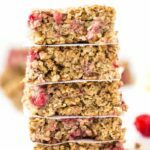 Then last summer, I changed up the fruit and made strawberry breakfast bars which were so delicious! But I still was liking the blueberries more… and after much deliberation, I decided it was because the berries were smaller and were more evenly dispersed throughout the bars. 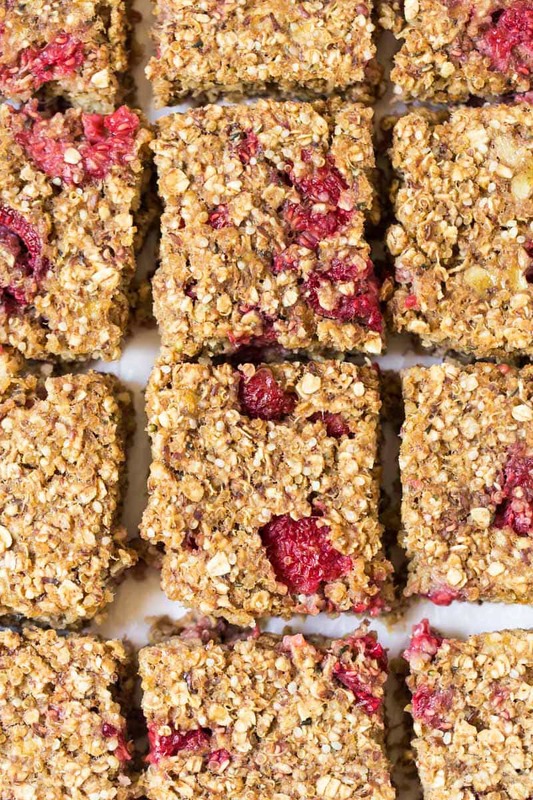 So this summer we're making Raspberry Quinoa Breakfast bars with a tangy lemon twist. They're super simple to make, packed with nutritious goodies and make an amazing breakfast option when you're on the go. This is my fifth iteration of this recipe and I think it might be my favorite one yet. They're light, summery, filling and I love the burst of lemon with every bite. They also have a really nice texture – kind of like a cross between a cookie and a brownie. Dense, but still soft and chewy. For the base, we're using fresh ripe bananas which not only help keep the bars together, but we're also getting added fiber, vitamins and natural sugars. And because the bananas are sweet, we don't have to use as much coconut sugar! To the banana, we layer on flax eggs (also high in fiber and omega 3s), almond butter for some fat and protein, and then our oats, quinoa, hemp hearts and coconut sugar. I like to use coconut sugar as the sweetener here because it's lower on the glycemic index than other sugars (even maple syrup and honey), and it gives the bars a really lovely caramel flavor. And even though I love my sweet breakfasts, using coconut sugar doesn't make these bars overly sweet; just sweet enough to give you energy to power through your day! As we've talked about in some of the other breakfast bar posts, these bars are a fantastic option for meal prep. They store well in the fridge, but can also be frozen for later. So yes, definitely whip up a batch and save some for your breakfasts all week long! If you want more portable breakfast ideas, you might enjoy my Chunky Monkey Quinoa Breakfast Cookies, Carrot Cake Blender Muffins or even my Herbed Quinoa Breakfast Wraps! 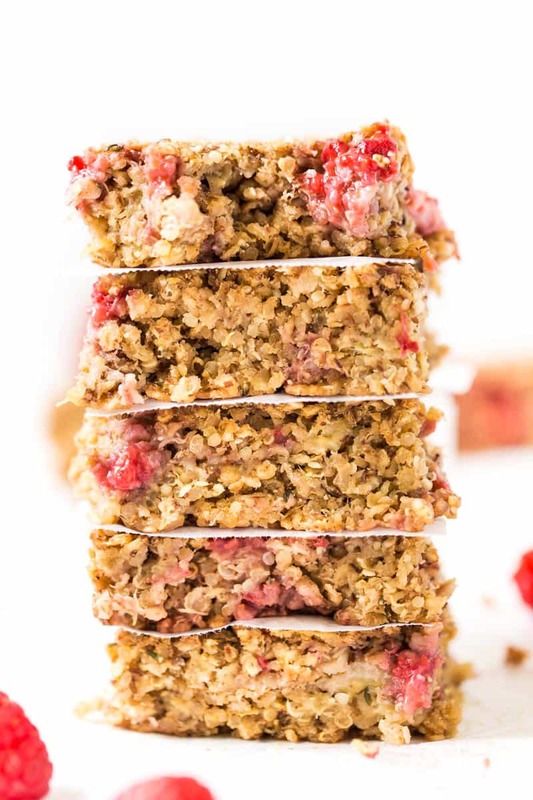 Can't wait to hear how much you ❤ these raspberry quinoa breakfast bars! 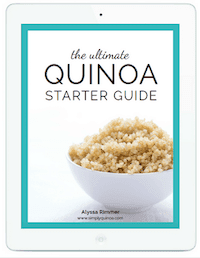 Make sure to tag me on Instagram if you snap a pic using #simplyquinoa or @simplyquinoa! 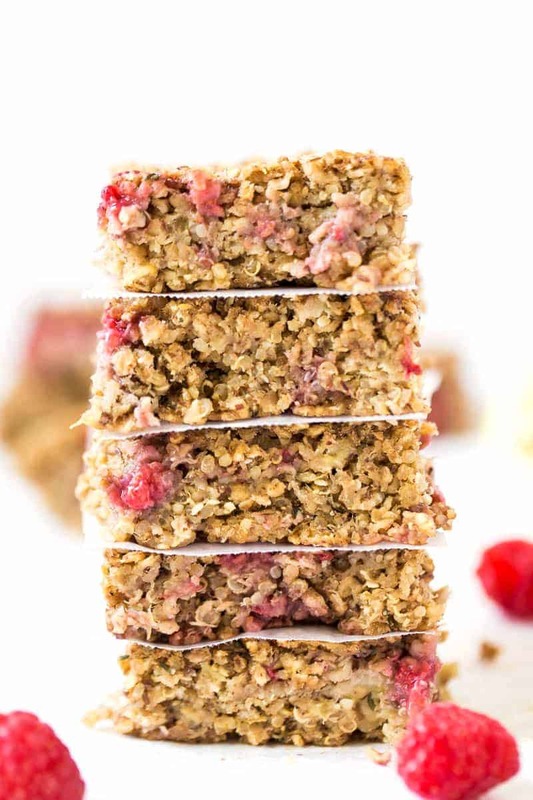 Watch how to make these Raspberry Quinoa Breakfast Bars! Preheat the oven to 350 degrees F. Line a 9″x 9″ baking sheet with parchment paper and grease the sides with cooking spray. In a large mixing bowl, mix the banana, nut butter, flax eggs, lemon juice and vanilla until smooth. Add oats, quinoa, sugar, baking powder, hemp seeds and lemon zest, and mix everything together until fully incorporated. The batter should be moist, but not runny. Fold in the raspberries. Bake on the center rack for 30 – 35 minutes until the bars are golden brown and firm to the touch. Remove and let cool completely in the pan, then remove and slice into squares (or rectangles). Store in an airtight container for 4 – 5 days. With what butter can I replace the nutricious almond butter? I‘m allergic to almonds. Can I leave out the hemp seeds? I haven’t amy flax seeds. Can I leave it out ? Or can I replace with something else ? You could try replacing it with chia! These look amazing! Do you think they would be ok to freeze? Could I replace the raspberries with blueberries or would the lemon make it taste weird? Would 2 large eggs be a good substitute for the flax eggs? I’m perfectly comfortable with chicken eggs. Eggs are good for met oo. Has anyone used real eggs? 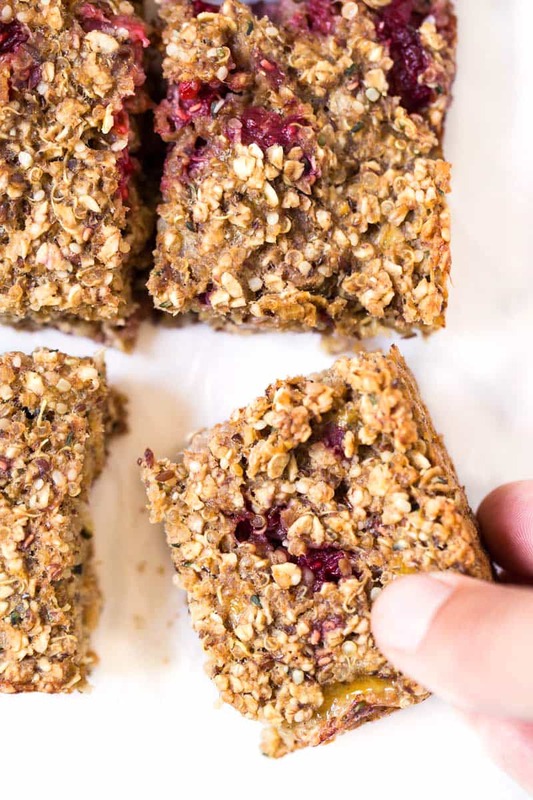 I’ve tried baking it and now we’re hooked with your Lemon Raspberry Quinoa Breakfast Bars. It makes me feel hungry every morning, so I do not care about my weight anymore. These sound amazing! Is there a way i can make them with frozen raspberries instead of fresh? Not sure if using frozen would make the batter too wet? I think that would be totally fine! I am allergic to bananas. Do you have a substitute for them in this recipe? Why quick cooking oats? I only buy old fashioned…. wondering if it’ll make a difference? Quick cooking oats absorb more liquid I’ve found. You could definitely try with old fashioned, but I have personally tested it that way! Awesome recipe looks so nice. I must try it. Wow, this recipe looks awesome. The way you describe it is really helpful. I will definitely try it. Thanks for the recipe. Love your blog. Keep it up. These look and sound absolutely fabulous! And lemon and raspberry are such refreshing flavors!